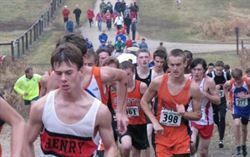 Patrick Henry's fastest distance runner/Nordic cross country skiier is accostomed to being in first place at the start and end of a race. On Saturday, November 16th Joe still led the way...as a Race Organizer in his First Annual Run for Hunger at the PHHS Track. Joe will use the successful experience (56 runners contributing 524 pounds of food) for his Eagle Scout Award. See runner times (must select Run for Hunger 2013 from pull down menu) and videos here. Joe is grateful for the volunteer time and efforts of Chong Khang '14 (arrived at 6:30 for setup), Jarrod Hoffman '14 (on world record pace until hat flew off), Nick Kestor '16, Andrew Clifton '16, and Anna DeGroot '14. Joe Clifton took first place in a 20K (12.4 miles) Nordic Ski Race with a time of 1 hr 5 minutes and 39 seconds. on Monday, January 16th at Theodore Wirth Park. Joe competed against over 40 other high school men from Washburn, South, and Southwest JV.